The following research into historical silver prices will make clear this point: Global silver market can move against you for a longer period of time than you are willing or able to wait. In other words, attributed to Maynard Keynes, "The market can remain irrational longer than you can remain solvent." 3000 B.C. - Silver mining began in what is now modern day Turkey. 1200 B.C. - Greece became the hub of silver mining. 100 A.D. - Spain became the major supplier of silver. 750 through 1200 - Silver mining spread throughout Eastern Europe. 1500 through 1800 - Spain produced approximately 85% of the world's silver in the New World (modern day Bolivia, Peru and Mexico). 1800 through 1875 - Silver production increased from 40 million ounces to 80 million ounces world wide. 1900 - Total production world wide reached almost 120 million troy ounces per year. 1920 - Production increased to about 190 million troy ounces annually. Today - Annual global mine production averages over 670 million troy ounces. As you can see from the bullet points above, annual production of silver has increased by almost 1700% since 1800. The increase in demand was not enough to keep up with supply during that time as prices were decreasing. Now let's take a look at Figure 1 below. 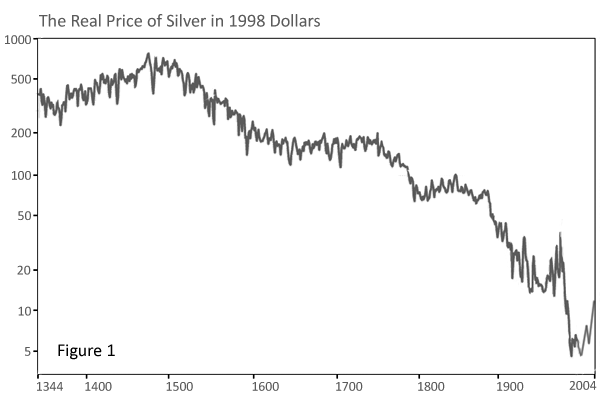 In this figure we have a 600+ year graph of historical silver prices (in 1998 dollars). This graph was being shown around the web a few years back. I simplified it for the purposes of this discussion and for clarity. It shows, surprisingly, that silver has been in a bear market since approximately 1470! Over this period of time, if you and your family were expecting to maintain generational wealth with silver you would have had the deck stacked against you. Who would have thought that something with a finite supply could have experienced a bear market for so long? Silver exploration became global as more large deposits were found and exploited, especially in the "New World." Advances in mining technology increased efficiency of production. 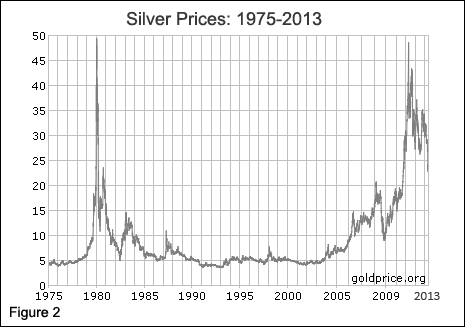 In Figure 2 below we see a 40 year historical silver prices chart from GoldPrice.org. This is more useful as it shows prices that many of us, particularly "baby boomers", were actually alive to see. Note: the price of silver has continued to decrease in the last few years since this chart was created. What does Figure 2 tell us? Silver prices seem to have been on a pretty wild ride in the last 40+ years. But if you bought silver in 1980, like many other people during that mania phase, you would have lost a lot of wealth in the next decade or two. You would probably still be in the red even today. This may seem like a strange article to be found on a pro-silver website. Don't misunderstand. I am very pro-silver. Read all the other articles I have written on this site and you will see why. But having said that, the historical silver prices show rather conclusively that silver can go through long periods in a bear market. As a human being, and particularly as a "baby boomer", you have to realize your time is limited on this earth. You can't bet all you money on one thing and lose for 50-100 years. So, going all-in on silver or precious metals investments like Mike Maloney is not something that seems to be a prudent thing to do. I admire Mike and agree with many things he says but I need to have my portfolio diversified. So, if you believe in silver in the long run, like me, what should you do? What do all the gurus like David Morgan, Gerald Celente, Eric Sprott and even Mike Maloney say? DOLLAR COST AVERAGE! Allot a certain amount of money every month to the purchase of silver. Nothing drastic. Do it comfortably. Over time you have a much better chance of profiting when you dollar-cost average than if you buy silver in one or two purchases. Although, we do have records of historical silver prices, no one can know what the price of silver will be in the future. But we can say for sure that as time goes on odds are the price of silver will increase. Dollar-cost average your silver purchases as part of a well-diversified portfolio. Re-balance that portfolio every year. With any luck you should reap the rewards of your patience.